We are excited to announce an entirely new way of managing your Salesforce releases. This simple addition to the Blue Canvas platform unlocks an entirely new set of features that you can now leverage for your Salesforce deployments. Business applications teams are spending so much money on Salesforce that every hour saved releasing generates significant ROI. With Blue Canvas’ latest releaase, you can free up time so that your developers can work on high value tasks like improving your business applications. Furthermore, this new flow gives businesses more visibility into the “why” behind releases which helps with audits and business continuity. Bulk Deployments build upon Blue Canvas’ concept of Deployment Requests. 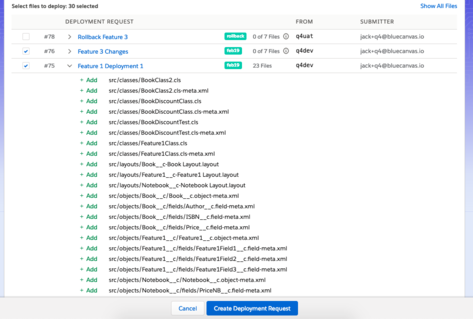 A Deployment Request (DR) or “story” is an optimized pull request for Salesforce that makes it simple for admins and developers to submit code and declarative metadata changes for review and deployment. Imagine if you combined a change set with a pull request in Git without having to use the command line or manually remember every change you made using spreadsheets. A story can be any change. Sometimes it’s a hotfix, other times it’s a fully fleshed out feature ready for delivery, still other times it might just be a new field that a Sales VP has demanded today! DRs allow developers to submit their changes as pull requests on an ongoing basis. Make a change, open a DR and submit it for review. You can then quickly deploy it into INT, UAT or other environments. Often a DR, or “story”, corresponds to a ticket in JIRA, VSTS, or other ticketing system. Bulk Deployments allow a developer, release manager or admin to then take multiple DRs or “stories” and push them into other environments. When you want to promote changes to UAT or to Production, it can be useful to generate a quick look at all the stories that are ready to go. Bulk Deployments allows you to select specific DRs and deploy them. You can say “let’s promote these two stories and this hotfix but not these other two stories.” It allows you to gate keep based on the readiness of different features for a given release. When selecting a DR it will include all of the components that were deployed in that DR. This allows release managers to deploy without manually selecting or even having to understand which changes have gone into the DR. This saves time and allows domain experts to manage their own deployments. The core benefit of Bulk Deployments is that it gives Salesforce teams even more control over what changes are deployed where and when. By leveraging the power of DRs, developers can now package their own changes for review and approval. You no longer need to have a full time headcount dedicated to that purpose. You can also move much more quickly because it’s easy to see what DRs are supposed to be shipped and which need to follow in a separate release. Bulk Deployments also allow you to reduce bugs because you can ship small units of change continuously instead of putting a whole heap of changes into a single release and hoping for the best. 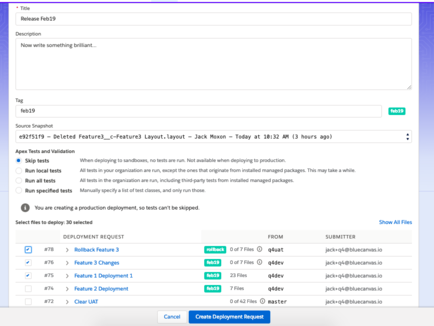 Release managers love Bulk Deployments because they can simply open up a single dashboard, select features and deploy them to whatever environment they want to and can even clone upstream. Bulk Deployments also make it easy to rollback changes that you don’t want because you’re effectively bundling each change. 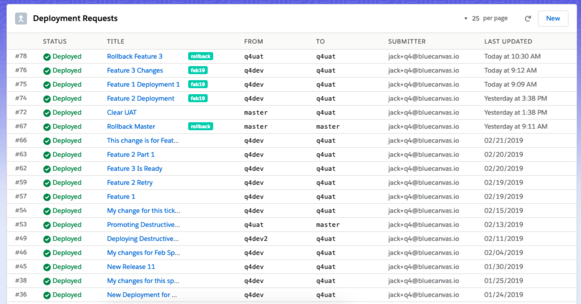 Blue Canvas uses Git to manage Bulk deployments so you can actually rollback a previous feature or even a single component within in a release if you want to. This further drives quality and speed because it gives developers the freedom to move fast while having a safety net. If your goal is to be more Agile, Bulk Deployments are for you. Instead of monolithic releases every quarter, you can now deploy on a weekly or even daily basis to multiple environments. Management and developers alike have far greater visibility into who is changing what and where and you can actually predict how many tickets are actually going to make it into a given release. AT A HIGH LEVEL, WHAT ARE BULK DEPLOYMENTS? A new workflow based on how we’ve actually seen users behave in the wild. A new way of conceptualizing your releases and units of work. 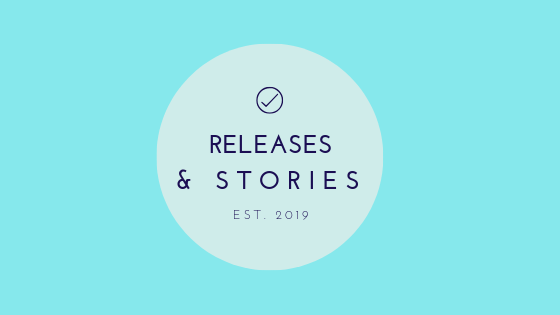 You can now create a “Release” with a bundle of several DRs or “stories” that have been created over the preceding days/weeks. Faster deployments because release managers are only selecting full features rather than individual components. Squash commits into a single larger commit with a description, comments, logs etc. WHAT DOES BULK DEPLOYMENTS COST? Tasks are included as part of the Blue Canvas platform at no additional cost! WHAT IS A DEPLOYMENT REQUEST? A Deployment Request is a unit of change in Salesforce. That will be different for different organizations. A DR has a title and a description. It also includes components which are actual code changes in Salesforce (declarative and Apex). At any given point in time you can look at a DR, read it’s description and see the progress that has been made on the task. CAN THE PERSON WHO CREATES A DR ALSO DEPLOY IT? During onboarding you can work with Blue Canvas to create various permissions for deployments. Useful for SOX compliance. CAN I RUN TESTS BEFORE DEPLOYING A BULK DEPLOYMENT? Yes! You can set up your Bulk Deployment to run whatever level of tests you want.